It would be very useful to be able to sort by album when performing a search for instance by Composer ! Can you clarify. You can already browse by composer and sort by album title at the same time. What precisely are you trying to do, from what screen? Once you have selected a composer, Roon displays a list of works. If you then click on a particular work, Roon then displays the albums that contain it. For instance when I click Back I have more than 20 albums and I don’t want to see the tracks but spot in the albums ! Composers, search Bach and select. This will then restrict the display of albums to only those that referance Bach. I think what you want is a link from the Composer page to the Album browser with a focus on that composer. But more seriously, what are the problems with search and what would you prefer to see ? This could do it ! At the very end the less number of clicks to get something the better. Another way would be to show the albums spot in the selected composer page ! Searching by composer does not display albums in the results but only tracks. This is very annoying because there is no easy way to see for instance all Beethoven albums ! David, I’ve moved this into your exiting topic. Hello. Any progress on this feature ? Painful to use roon for classical music ! I just signed up for Roon today to try it out for my dad. I’m using a brand new MacBook Pro with fully updated software, and I just downloaded Roon a few hours ago, so presumably everything is up to date. I can’t find a way to organize classical albums by the composers’ last names. I can get a list of composers organized by their last names (seemingly all composers? ), but I want a list of classical albums–specifically, the classical albums that I’ve favorited on Tidal (or in the future the classical albums that I’ve downloaded and/or favorited on Roon). I poked around and found an old thread about this in which the conclusion was that it can’t be done, and I didn’t find anything newer that answered my question (after making a fairly modest search effort). I’ve shifted your post into this Feature Request because Roon cannot currently sort Album by Composer and it remains a feature request. 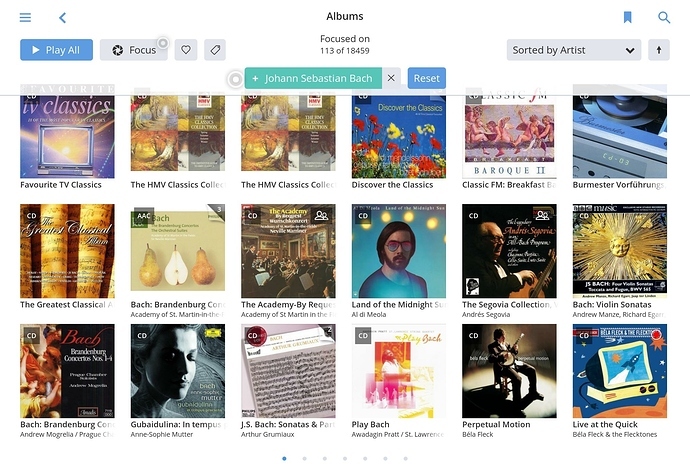 You can sort Classical albums using Albums/Focus/Genre/Classical and make a Bookmark to recall that view with a click. You can also click that Focus from + to - in order to view all Albums that are not Classical. Within that Classical focus you can sort by Artist, but, as I’m sure you will agree, that is not the same as sorting by Composer. You can also view your Roon library by Composer, but that is Work based, which is not always what you want. I would still very much support a Sort by Composer view in Albums, Tracks, Genres etc. so lets hope that this Feature Request gets sufficient support to become a thing ! Thanks for replying. The best option at this point seems to be to focus your albums on classical and then sort them by album title. That way you’re good to go for all of the albums that put the composer’s last name as the first part of the album title, which is a decent percentage of classical albums. Not perfect, but it prevents the problem from being a deal-breaker (for me anyway). I wanted to third Ludwig’s request. And me. If I restrict Albums to say Beethoven I get 300 odd albums - I can’t read all the titles (not visible) so have to go through 1 by 1 looking for Symphony No 2 and the artist I want. It won’t allow me to restrict to Beethoven and 2 or Beethoven and Symphony - says try removing some Focus criteria. How nice to select on a Composer and see all the Albums rather than a 100 “1 Allegro” all from different albums. I agree. For example, I have the complete Beethoven string quartets by two different quartets and it seems impossible to organise them so I am playing the right movements for each quartet in the right order. I am on a trial period with Roon and if I can’t work out a better way of managing my classical music (about 50% of my listening) it feels like this will be a deal breaker.